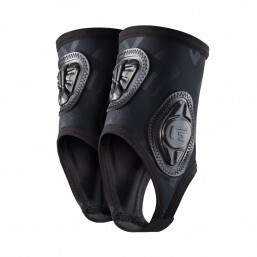 Light weight, yet extremely effective ankle protection from the mad scientests at G-Form! 3 x impact absorbing RPT pads keep your ankles safe. 1 pad to take front on impacts (or for achilles protection if the pad is reversed) and 2 pads (1 for each side) keep your ankle covered. *G-Form have taken an interesting approach to sizing their ankle guards, using the height of the wearer to determine the best size. Have faith - based on our tests around the office it seems to be pretty on point. The only caveat being; a US 9 foot is at the absolute limit of what one can comfortably get through the S/M pad.